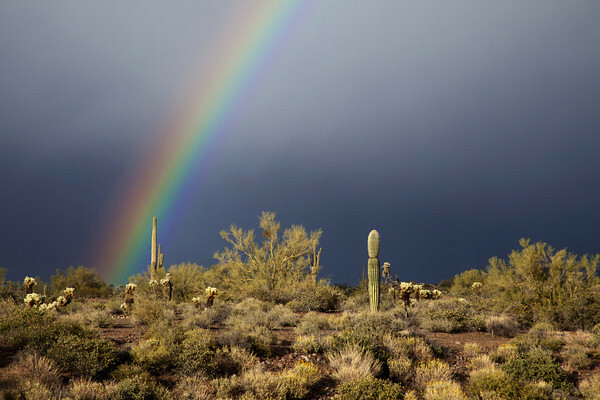 A clearing storm at Lost Dutchman State Park in Arizona created this rainbow over the desert. I arrived at the park with about an hour of light left in the day. It began to rain and I was totally exposed with out an umbrella and any protection for my camera gear. I set up my tripod in anticipation of some light coming from under a cloud. This rainbow formed briefly and faded slightly then it came back much stronger so I had to work quickly and find some foreground interest, I was hoping to capture the complete arc with the right side over the Superstition Mountains but it never formed. I moved around and found some cactus and desert brush to give me some for ground interest. I was able to take a few frames and was satisfied with the result.